Straddling the Cascade divide between Four Mile Lake and Crater Lake, the Sky Lakes Wilderness encompasses 113,590 acres. Six miles wide and twenty-seven miles long, the lake basins provide almost 200 lakes, although most are shallow and do not support fish. Some of the lakes are more aptly described as shallow ponds, and the average size lake is between 30 and 40 acres. The largest lake is Fourmile Lake, which exceeds 900 acres and can be driven to from Highway 140. 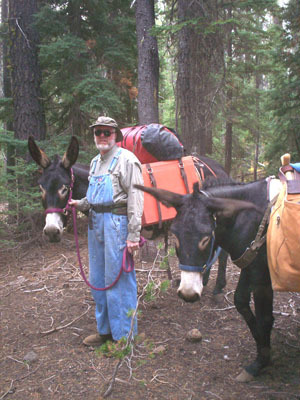 It is not surprising than that I would pack into this wilderness on two occasions with my two pack donkeys, Harley and Lately, and get skunked because I didn’t do my homework. To check on stocking programs for the area, I learned from Dan Van Dyke at ODFW that a number of lakes are stocked with fingerlings every other year from helicopter. Of the Blue Canyon Group, Blue Canyon Lake, Carey Lake, and Horseshoe Lake are stocked. In the Seven Lakes Group, Alta Lake, Cliff Lake, Grass Lake, Ivern Lake and Middle Lake are also stocked every other year. Van Dyke went on to say that the growth of the fingerlings are slow, but it is not uncommon to catch rainbows and brooks up to seventeen inches with a string of moderate winters. Van Dyke commented that Grass Lake typically held the largest fish, but they are known to be picky. Middle Lake took second place for fish size. Cliff Lake usually holds the smallest average sized fish, and the survival numbers go to Alta and Ivor Lakes. I also spoke to Jeff Von Kienast, wildlife biologist at the Prospect Ranger District. In years past both men have had good fishing in Grass Lake and Middle Lake. Jeff said that he had success fishing Middle Lake on the far side of the lake, and that a number of years ago he did very well at Grass Lake. Dan said that he took a number of Medford fly anglers into Grass Lake a few years ago and that anglers with float tubes did well while the shore anglers really struggled. My first trip into the wilderness was from the trailhead at Fourmile Lake in early October, 2008. Our destination was Long Lake. We passed the first lake, and I noted that the shoreline was very shallow, and there was no way I could reach deeper water casting from shore. It was a harbinger of what was yet to come. Long Lake is beautiful, and we had a wonderful camping spot. From every elevated vantage point, I could see the shallow bottom for thirty yards and more. I never spotted a cruising fish. For two days and two evenings, I never spotted a rising fish. On October 25 I packed up the donkeys and headed into the Seven Lakes Basin. This trip started out badly when I discovered the perverse machinations of the Forest Service. The Sevenmile Creek trailhead is two-fold – one for equestrian users and one for hikers. “No trailers beyond this point” read the sign, so I pulled into the equestrian trailhead parking lot. Towering above me was a steep mountain. Up and up we went traversing the switch backs to the crest. My mantra, taken from the children’s book, The Little Engine that Could, began, “I think I can, I think I can, ” and ended with sighs, coughs and grunts. Up over the ridge we went and spiraled down slope until I could see a sparkling spot of blue peeking through the dark forest. I was puzzled because I had only been hiking for fifty minutes, and my map showed no lake this early in the hike. Trudging down the trail, the forest thinned enough for me to see a dark blue Ford truck. Fifty-five minutes of hiking over a mountain top, and I had arrived at the hiker’s trailhead! Further in I met a hiker carrying a spinning outfit. He said that he had no luck at Grass Lake or Middle Lake, although he said that he had caught a few skinny fish at Cliff Lake. I camped at Grass Lake late that afternoon. From the hiker’s trailhead, I made it to the lake in three hours, which included a 15 to 20 minute lunch break. The sign at Grass Lake pointed to the trailhead at 6.5 miles. Too pooped to fish, thanks to my extra hour of hiking, I studied the shoreline of Grass Lake and Middle Lake. Like Long Lake, the shoreline was very shallow, and I could see mud for thirty to forty yards. I never saw a rising fish that evening. The next morning I fished Middle Lake casting as far as I could, but I had no luck. The fact that I could not spot a single fish nagged me until I wondered if the severe winter of 2008 killed off a lot of fingerlings. If you have any information on wilderness fishing lakes in Oregon, which can be reached withing six or seven miles, I would love to hear from you. Directions: Highway 140 has a signed entrance to Fourmile Lake between Klamath Falls and Medford, Oregon. 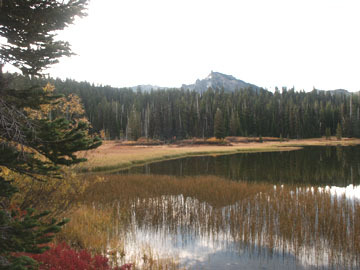 The Sky Lakes Wilderness may also be accessed from a number of trailheads off the West Side Road. You will find this road off of Highway 140 on the Klamath Falls side of the mountains. Look for the signs to Rocky Point. This page contains a single entry by David Archer published on November 2, 2008 8:21 PM. Lone Pine Area Campgrounds and Fishing was the previous entry in this blog. Crane Prairie - Bend, Oregon / Highway 97 is the next entry in this blog.